Now finalised to a short bulletin with the original as-news-came-in report below. Further information is mostly in the comments that follow. At 4:45am, New Zealand time, an earthquake reported at 7.1 on the Richter scale, occurred ~30km to the west of Christchurch in the South Island of New Zealand. The USGS and GeoNet have reports of the event. A short summary of initial news is below the images. I’m not at the scene, but am familiar with the town and neighbouring region as Christchurch is my hometown. My overall impression is of damage to brick structures (facades, chimneys, walls on a few older buildings) particularly on older buildings, surface damage to roads and footpaths. Several reports include a broken water and sewerage mains. Power is out in the region, with the airport closed at the time of writing. There are many reports of damage to goods within houses, as you would expect. There appear to be no causalities reported, but more recent reports are of some more serious injuries including one patient in intensive care. A good early summary can be found at the National Radio website. Kudos to the TV news for getting a hold of geologist early on (9am report). From his comments, there was apparently a surge of water down the Avon river which may be responsible for some of the flooding reported. The remainder of this post is the original, written with updates as the news came in. It’s messy, hence me hiding it under the fold, but there are some early pictures for viewing. Some advisories or reports of more interest to local readers are still occasionally being posted in the section below; most are in the comments that follow this post. (The lazy solution!) These updates will be infrequent from now. My best wishes to all those in the region. On-going report of earthquake this morning close to my hometown, Christchurch. I am editing this as news comes it. It is a little messy, but you’ll have to live with that! 9:45am: Christchurch Hospital is asking that minor injuries be taken to local services if possible and that people stay at home (I imagine they would like to limit ’disaster tourism’ from hampering services). People are asked not to use the cellular phone network, to reserve it for those in need. From TV news bulletin. Centred 30km west of Christchurch. Chimneys down. Facades down (as in photos below, I would think, the central part of the town features these). Civil defence repeats report of no causalities. Power down in Christchurch / central Canterbury. Christchurch Hospital reports no major injuries. On that positive note, I may slow down this reporting! UGSG report updated to expect damage, centred on Western suburbs of Christchurch. Tsunami report says no threat to Pacific/Hawaii region. Initial reports are of a 7.4 event centred near my hometown, Christchurch. Reports from relatives are of broken paintings from the walls, pottery, etc. No reports of personal injury. 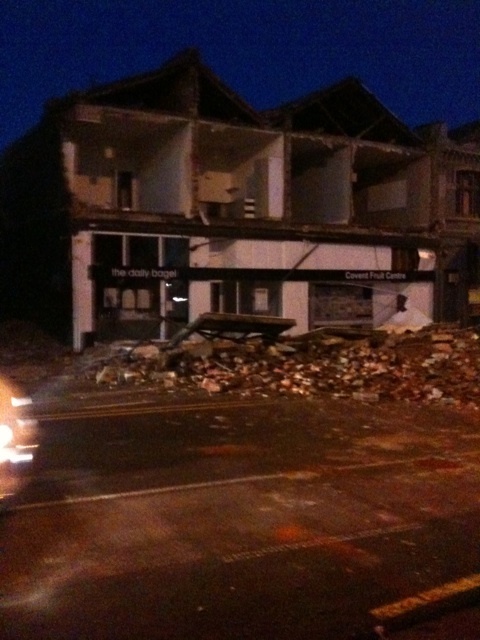 Early media reports include buildings from my hometown badly damaged. 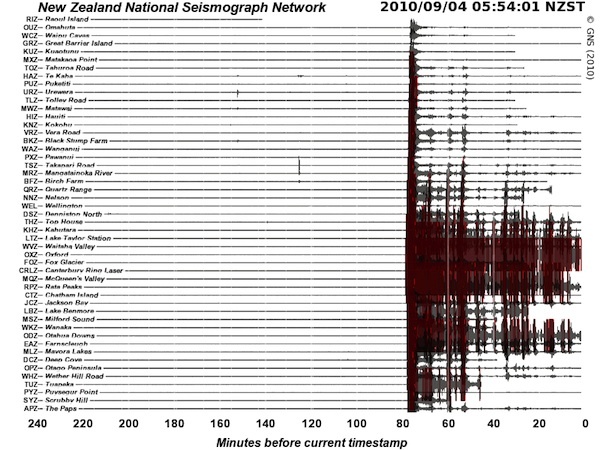 Below I have included seismographs from GeoNet. Best thoughts to others in the region. Certainly was an impressive shake, Grant. Up here in Waipara we were on the edge of the big movements, but our old house was flexing like it was on an ocean swell. But very little damage beyond a few pictures askew. Family in ChCh report much more shaking – at my son’s girlfriend’s house, a foot of water slopped out of their spa pool, plus lots of furniture/TV damage etc. Good to hear family is OK. Similar reports from my folks. Thanks. Seen photos of what someone described as ‘mud volcanoes’ – must look into that more later. Any geologist want to comment? Good to hear you guys are okay – I was on the 5th floor of my girlfriend’s apartment in central Wellington and it woke us up and had the place gently shaking for 10 seconds.We knew then it was fairly sizeable. Hope all other Scibloggers in the region are okay, especially our natural hazards guru, Jesse Dykstra! Just for anyone following this, any updates now will be infrequent, if at all and quite likely will be only in the comments. Best wishes to those in the region. As of around an hour ago Stuff.co.nz is reporting two serious injuries, and man struck by a chimney, and a 50-year-old man hit by falling glass. 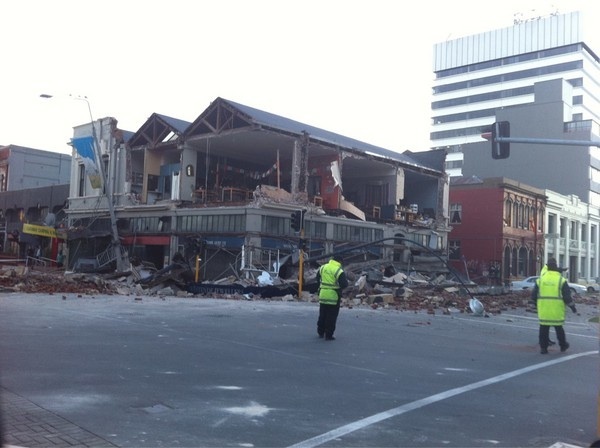 This will be quite a lot of work to clean up, Christchurch friends are facebooking with destroyed chimneys. Hopefully there aren’t any other serious injuries. Strong, S.W., 1933. The Sponge Bay uplift, Gisborne and the Hangaroa mud blow out. New Zealand Journal of Science and Technology, vol. 15, pp. 76-78. Thanks for the extra info guys. I know it’s a weekend, but I actually have work to do (sigh), so I won’t be able to follow the news all day, so any info updates are appreciate from here! Like a lot of people I’m waiting until services are more normal to catch up on the wider family & friends up that way and hear how they fared. Notice to the left of the rails the neat parallel furrows in the soil where the sleepers have been pushed sideways. Many people have been without power for a couple of days. (A small number are still without power.) Most frozen food would have to be discarded. That’s a lot of frozen food to discard and replace. Be advised that the PDF is large! Reports are of further damage, including a report of damage to and closure of the Lyttelton road tunnel that is the main road connection between Lyttelton and Christchurch. You can nitpick these infograhics endlessly (everyone’s wants/needs are differentâ€¦), but one thing that occurs to me is a tendency to think of the circles in terms of areas that the shock impacts, rather than being just a representation of the magnitude of the event. I found myself having to mentally remind myself that they’re not areas of impact. Ideally I would like to see the same thing, but plotted using effect on the ground but of course that could only be after lots of work gathering ground reportsâ€¦ One nice feature is that your can start from several different starting points, 3 hours ago, 6 hours ago, etc. The full thing takes quite a while to play. I used to walk in those rows. The collapse shown on television (a different set of shelves I think) have re-enforcing bars that span one row and the next at the top, but it seems these weren’t enough to stop them from collapsing on one-another. Perhaps the re-enforcing braces simply weren’t strong enough? I shouldn’t quite say ‘all’ in that last comment, but you know what I mean. Most, the key ones, etc. 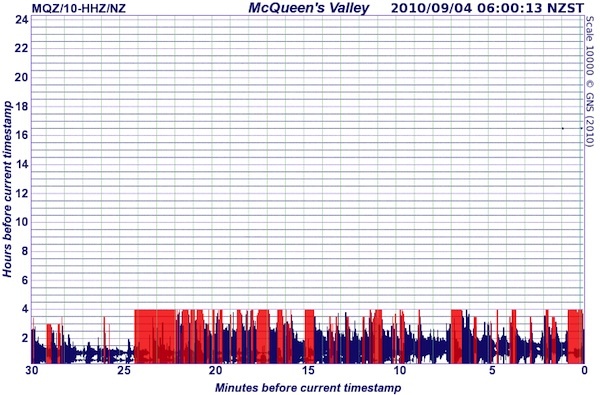 Looking at the GeoNet on-line seismographs and recent â€™quake reports, it looks to me as if the last 24 hours will be â€” if I am correct â€” the first full day without a â€˜quake equal to or exceeding magnitude 4.0 in the Canterbury region since the magnitude 7.1 event. Itâ€™s still pretty active compared to Canterburyâ€™s usual â€œnot much of anythingâ€. The previous earthquake at or about magnitude 4.0 reported in the region was a magnitude 4.5 event at 10:03 am yesterday, centred 20km SW of Christchurch. At least theyâ€™re getting something of a breather. A series 4-5 of close shallow aftershocks have occurred this evening within half an hour. One is reported M=3.8, but within 5 km of the city and at 8km depth, another M=4.1 again 12 minutes later within 5km of the city, at a depth of 7km. A M4.0 occurred just 3 minutes after the M4.1 referred to above. To help those outside NZ get a better perspective of these more modest ‘quakes if the central reference point for Christchurch is the Square, as I’d expect it to be, these events should be centred within the city boundaries. Geologists have said that the after-shocks would continue for weeks, and they certainly are. Today saw a M5.0, 20km west of Christchurch (depth = 15km). Less than half an hour ago a M4.8 after shock occurred, centred 10 km to the NE of the city, near some of the worst affected suburbs of the main event on September 4th. While the after shocks continue, this news briefing reports that burglaries rose ~22% in the period after the earthquake. Hot water cylinders were apparently one target, with water damage from removing them adding to the repair damage & costs. Several further >M=4 events occurred over the next 24 hours.